Love, Shelbey: Skincare Routine ft. Vitagoods "Spin for Perfect Skin"
Skincare Routine ft. Vitagoods "Spin for Perfect Skin"
So, here's what I've been using lately. FAVES! I've been using every variation this brand makes of makeup removing towelettes. Although the "Yes to Grapefruit" is particularly my favorite, I currently have the cucumber because this pack came with a free chapstick (sucker for freebies). I love these because they don't leave a nasty residue on your face once you remove your makeup. Plus, they're paraben free. WOOT WOOT! Another regular product of mine! I swear, I bought a Walgreens eye makeup remover a few months back and it was the worse decision of my life! It took 30 flipping minutes to remove my mascara, not to mention, it burned! This is the best eye makeup remover I have ever used! It's very emollient and removes your eye makeup with the slightest amount. It also leaves my eyes feeling nourished and moisturized. I switch back and forth between the BM Purifying Facial Cleanser and this one. They're both great, but I feel as if the Deep Cleansing Foam does give you that extra "clean" feel. It also lathers up very easily! This has been my eye cream for the entire summer. It's supposed to reduce the appearance of fine lines and wrinkles "instantly" along with lifting the eyes "instantly". I honestly can't tell a huge difference when I use it but I like the fact that you get two eye products. The white side targets fine lines and wrinkles where as the red size is supposed to lift the eye lids. Even though I don't notice a big difference in the reduction of fine lines, it's a very moisturizing product, which is why I keep using it. I recently started using a toner because I noticed that I couldn't get to the makeup that was getting stuck near my hair line which worried me about getting acne (I have severely dry skin and hardly ever get acne but one will pop up occasionally in those areas) It's amazing how much makeup you can miss near your hairline and jaw line. This toner is mild and I try not to use it all over my face since I have dry skin but I love the fact that it removes any excess dirt and oil. Bare Minerals "Active Cell Renewal Night Serum" is a favorite of mine as well. Sometimes it's strong enough to act as my moisturizer. It makes my skin feel so soft when I wake up in the morning. The Cell Renewal Serum helps to product cell turnover in the skin along with boosting your moisture levels. It's a great product! 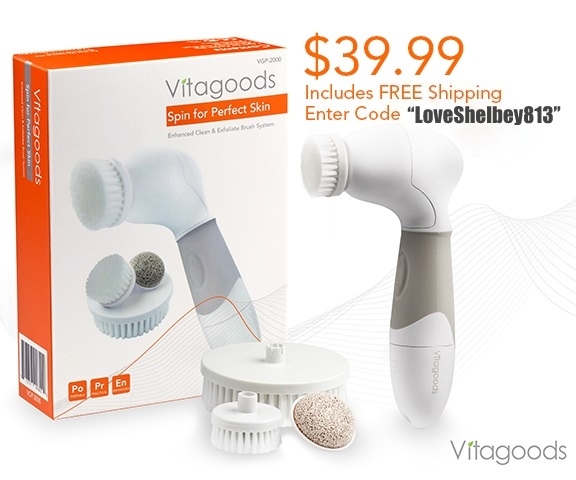 This is my newest skincare gem, the Vitagoods Exfoliating Brush System. First of all, let me say that I have been contemplating on buying a really popular exfoliating brush that can retail for up to $200. Dear Lord, I'm glad I didn't! The Vitagoods Brush System comes with a brush controller, exfoliating facial brush, soft exfoliating facial brush, body brush, and a pumice stone for your feet and hands. As you can tell, I've been getting a kick out of using this thing. It seriously polishes my skin up to feel as smooth as a baby's bottom! Not to mention, the brush heads aren't large and bulky so you can actually focus the exfoliation around your nose and eye area. The control is fabulous! My favorite brush is the "Gentle Exfoliating Brush" because it scrubs my face just enough to remove any dead skin cells/ makeup but doesn't leave my skin feeling like I've just had a layer removed. This entire set retails for $99 but Vitagoods was kind enough to give me a coupon code for 60% off the entire brush set which would only be $39.99 plus free shipping! If ya'll have been looking into expensive brush cleansing systems, I would highly suggest trying this awesome little set out first! I've seriously been loving mine. Especially since I have dry skin which is constantly flaking/peeling! I love the fact that the set comes with 3 full brushes plus the stone so you don't have to buy them separately! Be sure to use the code "LoveShelbey813" at checkout for the 60% discount! I hope ya'll enjoyed this post. Making a skincare "pictorial" was harder than what I imagined haha I'm just glad I got it done and was able to share some info with you guys. The "Spin for Perfect Skin" Brush Set was sent to me for review by Vitagoods. I did not receive any monetary compensation for this review, and as always, all opinions are my own. Do you know how long the vitagoods deal will be going on, as in, how long your promo code will work?! Thanks! Does bareMinerals have a toner?